Can you tell that I’m having a moment with pink peppermint? 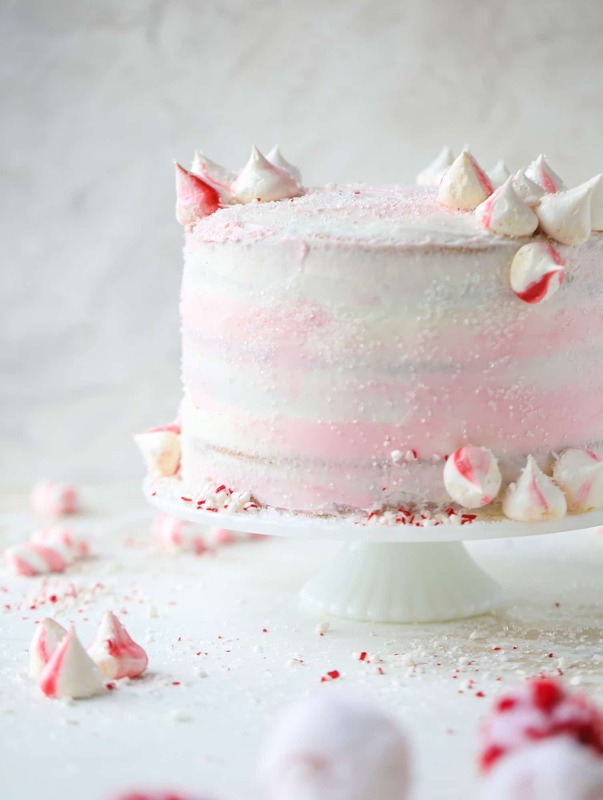 Pink peppermint cocktails, pink peppermint cake – I want to cover my entire life in pink peppermint. I’m also really kicking myself for not considering the “pink peppermint” theme when I decorated our house this year for Christmas! I mean, I’ve always said that I wish I could live in a life-sized gingerbread house. 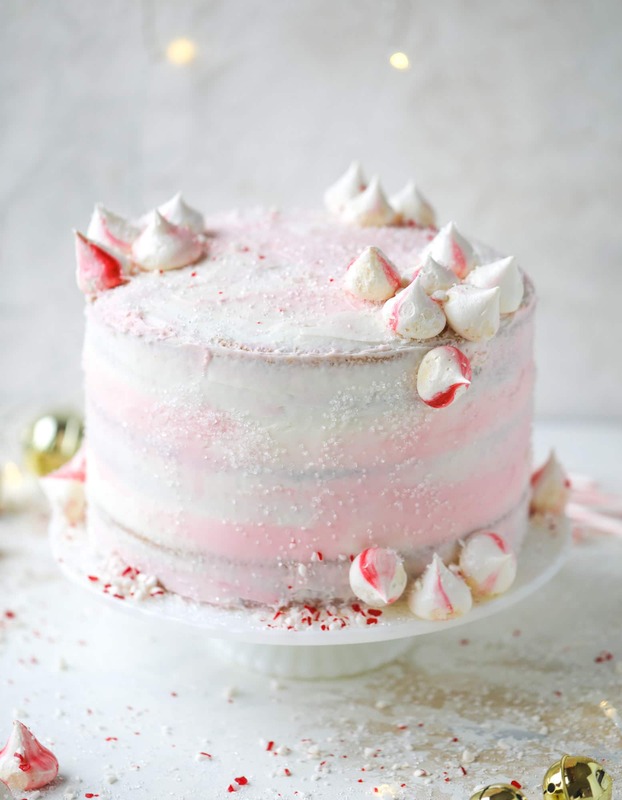 Ever since I made my White Christmas sparkle cake last year, I’ve been dreaming of ideas to do a pink peppermint cake. Seriously, I’ve been excited about making this since, probably… June? It’s hard to believe that we’re here now. I mentioned it yesterday in my pink peppermint cocktail post, but just the IDEA of pink peppermint is dreamy to me. It’s like fluffy fat vanilla marshmallows with creamy swirls of peppermint clouds – that’s how I envision pink peppermint. And you guys LOVED that white christmas cake. Some of you even made it this past summer with a different twist and you guys are all making it again now. It is a really delicious cake! And just so pretty! I might be boring, but I used the EXACT same cake recipe as last year. Why change something if it works, right? That’s the thing. It just works. And I wanted something that was light – as much of a chocolate freak that I am, I didn’t want chocolate cake here. SO I went with a vanilla cake and a peppermint cream cheese frosting. SO GOOD. It basically tastes like peppermint vanilla cheesecake! P.S. If you’re not a fan of using food dye (I’d rather not, especially when my kids are eating it), these color by nature powders are great. I first used them last year in my rainbow cupcakes and was shocked at how gorgeous the shades were! I also very much wanted to call this the Grinch cake! Doesn’t it look like it belongs in Whoville? It might be missing the green shade for the Grinch, but it could 100% reside in a Whoville bakery case. Since that’s a real place and all. Speaking of, we took Max to see the new Grinch this week and it was so cute. I still love the other Grinch movies but this was so fun and colorful and really had us laughing. I basically want to live in Whoville forever. I’m already dreading the day when we take down all of the twinkly lights. I mean, look at these peppermint meringue mounds. Aren’t they just too cute?! I made some peppermint swirl meringues the day before assembly which added a super fun twist. Going in, I had no idea how I would add them to the cake so I just started to stick them to the frosting. I knew I wanted to do something semi-whimsical to the pink peppermint cake but it took me days to figure out what exactly that was. I didn’t want to go the candy cane route (though a few crushed candy canes look so pretty here!) and love that these are an added little bonus to your cake or even your cookie box. I also went the (almost) naked-cake route again too. I frosted this one a little more than last year’s cake, but I love the rustic look of barely frosted cakes. Well, I sort of love the rustic look of barely frosted cakes. The truth is that I can’t frost a cake to save my life. I have the patience of a three year old (trust me, I have one, and this statement is accurate) and frosting cakes is not where my abilities lie. Rustic is also not my style… but this is one place where I LOVE the rustic feel. Just like last year, I added in the sparkling sugar too. It’s so pretty and really makes an impact in person! And also just like last year, you can totally use a box cake mix here. I’d say you guys are pretty 50/50 split. Half of you use a mix and the other half of you make it from scratch. My grandma who baked from scratch every day, also used mixes often, so I have no qualms about it! In fact, I’ve been known to make some killer cupcakes… from a mix. In all seriousness here though, the cake is delicious either way. It’s how you put your own fun, whimsy spin on it that will take it over the top. And make it Christmas-cute! 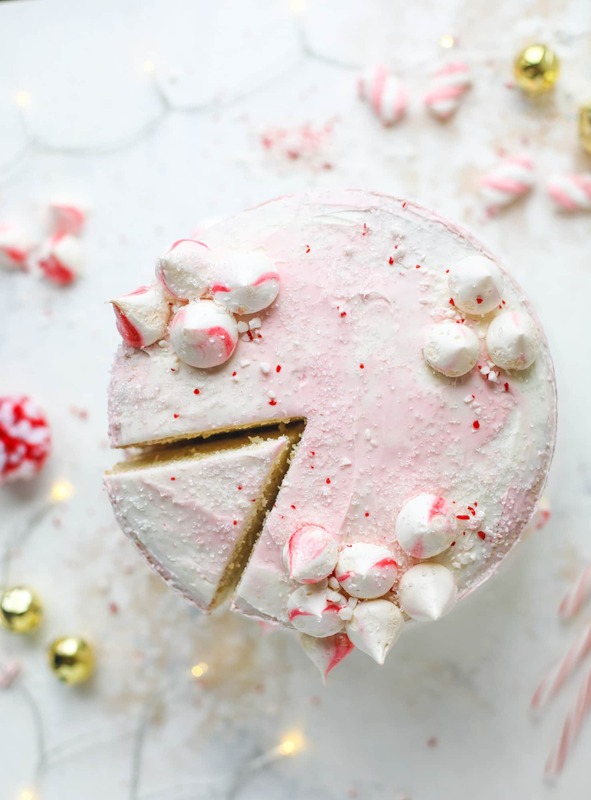 This pink peppermint cake is festive and delicious for the holidays! 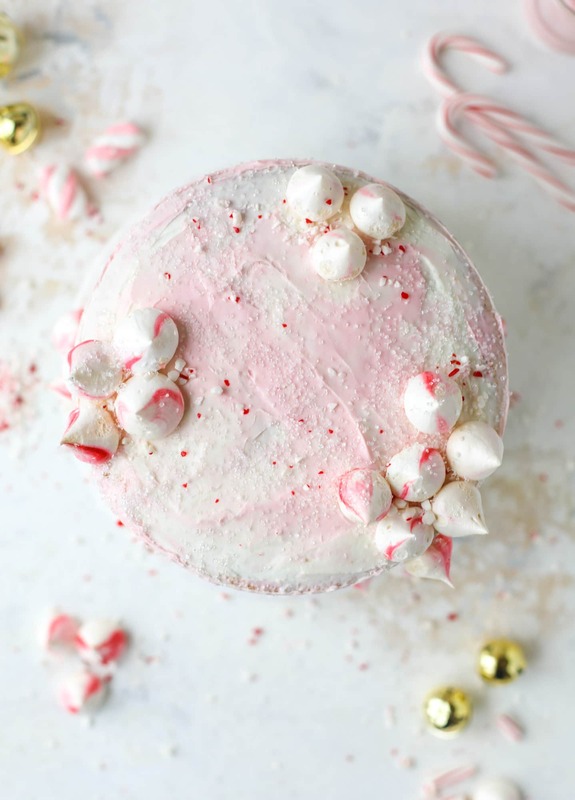 Layers of vanilla cake frosting with peppermint cream cheese frosting, covered in sparkly sugar and peppermint meringues. Couldn't be cuter! In the bowl of your electric mixer, beat the butter until creamy. Add in the sugar and beat on medium speed, scraping down the sides when needed, for 3 to 4 minutes, until light and fluffy. Add each egg one at a time and beat after each addition, beating just until combined. Beat in the extract. Gradually beat in half of the dry ingredients, then add in the milk. Add the remaining dry ingredients. Be sure to scrape the bottom of the bowl and make sure all of the ingredients are combined. To frost these successfully, once they are cool, I wrap each cake in plastic wrap and place is in the freezer overnight. I remove and frost the cake while frozen, just because it’s easier for me. To make the “naked” frosting look, I layered the frosting in the centers of the layers, then spread some on the sides but used a large spatula to scrape most of it off. As soon as I frost the cakes, I throw white sparkle sprinkles on the frosting. I then stick on the peppermint meringues! In the bowl of an electric mixer, mix the butter and cream cheese on medium speed until smooth. Gradually add in the powdered sugar with the mixer on low speed, increasing the speed once all of the sugar is added. Add in the vanilla extract, peppermint extract then beat on medium to medium-high speed for a good 2 to 3 minutes until creamy, scraping down the sides if needed. If you find the frosting it a bit too thick, add in some milk 1 teaspoon at a time until desired consistency is reached. I love how this frosting works on cakes once they are refrigerated! It’s delicious. To add some pink to the cake, I remove about 1 cup of frosting and add a drop of food coloring to it and mix until my desired shade it reached. Once the cake is mostly frosted, I add this on and use a spatula or bench scraped to make it appear swirled with the white frosting. Preheat the oven to 225 degrees F. Line a baking sheet with parchment paper. In the bowl of your electric mixer, beat the egg whites, cream of tartar and salt until soft peaks form. Gradually add the sugar and beat until stiff peaks form. Fit a pastry bag with your favorite tip (I like the plain old round one). Add a drop of food coloring down the side of the bag. Fill the bag with the meringue mixture. Pipe out dollops of meringue on the baking sheet, about 1 inch apart. Bake for 1 1/2 to 2 hours. The meringues should be totally dry on the inside (you can break one open to check) but shouldn't brown. Turn off the oven, leave the door ajar and let them in the oven until it cools completely. Remove them from the parchment with a metal spatula. NOTE: YOU CAN TOTALLY USE WHITE CAKE MIX HERE TO MAKE THIS EASIER! I’VE DONE IT TWICE ALREADY. IT’S FINE! USE 2 BOXES OF YOUR FAVORITE WHITE CAKE MIX FOR 3 OR 4 LAYERS OF CAKE. I would still suggest adding the vanilla extract and almond extract to the white cake mix. Or just use this recipe listed. While I already had the menu planned, I may have to make this for our Christmas party – it is just such a knock-out! Love the mini meringues! This cake is absolutely beautiful and perfect for Christmas! Oh my… this cake is straight out of Candyland at Christmastime. LOVE!!! Do you use a drop of gel coloring or liquid for the meringue? Those meringues are so cute! I’n going to try them out to round out my cookie platters. This cake is UNREAL! Seriously drooling over here! Absolutely festive and dreamy looking. Thank you and yes, those peppermint meringues are sooooo adorbs! Thank you and have a very wonderful, blessed, time of year. This is an absolutely stunning cake! The sparkle from the sugar is everything! And I’ve been dying to make mini meringue kisses for years – maybe I’ll give them a go this year! Hi, I’ve made the cake for Christmas Eve (it’s in the freezer). Do you have a video on how to get the effect of the frosting? This has to be delicious.